Use what students love and know in the classroom. LEGO! Create entertaining dialogues using ONE photo and the Ken Burns lens. A simple animation your children can direct. Drawing on children’s interest makes learning in the classroom highly engaging. 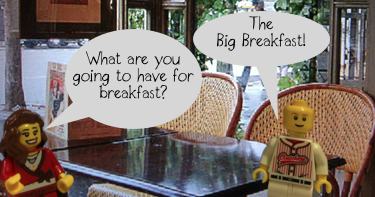 Using LEGO men or women students can create an animation that is easy and simple. This movie is made with just one photo, and a simple effect named Ken Burns Lens (iMovie). In literacy, a story plan can be devised, identifying the setting, character and conversation by the children. The children use their story plan and create a dialogue between their characters. The dialogue could be about a conversation a family is having, it could be an argument between siblings or it could be about a robbery. It is open ended and can be accessed by all learners. See below for the Modern Family plan (right click to save). Once the setting has been identified by the children, simply encourage them to find a background using flickr.com or google images. Once the background has been chosen, make sure the picture is in full screen mode. Place your LEGO characters in front of the computer screen and get the children to take a photo. The idea is to only take the background and LEGO characters and not the screen. Upload the photo into iMovie and use the Ken Burns Lens feature to direct the start and end point of motion. The children record their dialogue over the pictures. The picture timing will need to be adjusted accordingly to match the dialogue.